9001 E. Terry & Sons, Plymouth, CT pillar and scroll clock. This is a good, original clock with very few faults. It has been very nicely refinished and the veneer is just about perfect. The scroll top, feet and skirt are all original with all the original glue blocks. The only item of note is that the top inch or two of the right scroll tip has been replaced. It was a skillful job and it looks good from the front and back. Another plus is that the reverse painted glass is the original. You can see that it has a fair amount of flaking but plenty of the original is there and it is a good candidate for restoration by Tom Moberg. The upper glass is also original and the putty for both glasses has not been altered. This clock retains the original dial with gold spandrels. Note there was some shrinkage paint loss across the very center of the dial. That has been touched up and the color match is good but the loss area is visible. The label is in especially good condition and the hands, pendulum and weights are the originals. The brass finials are proper replacements and there is no rear tin cover. It has the original wood movement which is complete and no broken or missing teeth were visible on my inspection. The pendulum wire loop on the verge crutch does need to be straightened back to the correct shape. This is a 30-hour clock with bell strike on the hours. 9002 Rare Norris North, Torrington, CT pillar and scroll clock. 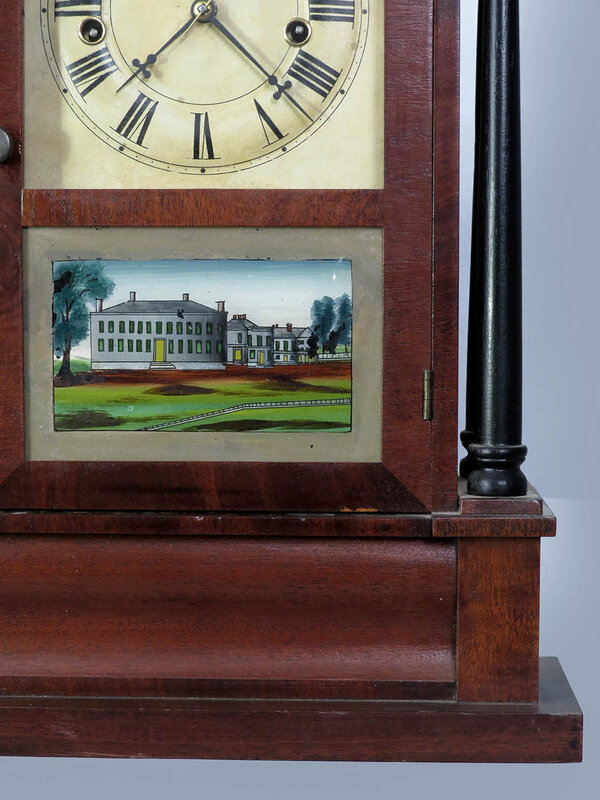 This is a very nice clock by an important maker, scarce and very collectible. The mahogany case was nicely refinished long enough ago that it has developed a good patina. The scroll top is perfect without any damage or repair. The skirt is the original but you can see that there is one veneer piece missing and the left two feet have been replaced. The job was very well done and hard to detect. Both glasses are replacements. The reverse painted tablet was professionally done with a gold leaf pendulum opening and a stenciled border. The painting is perfect without any flaking or lifting. 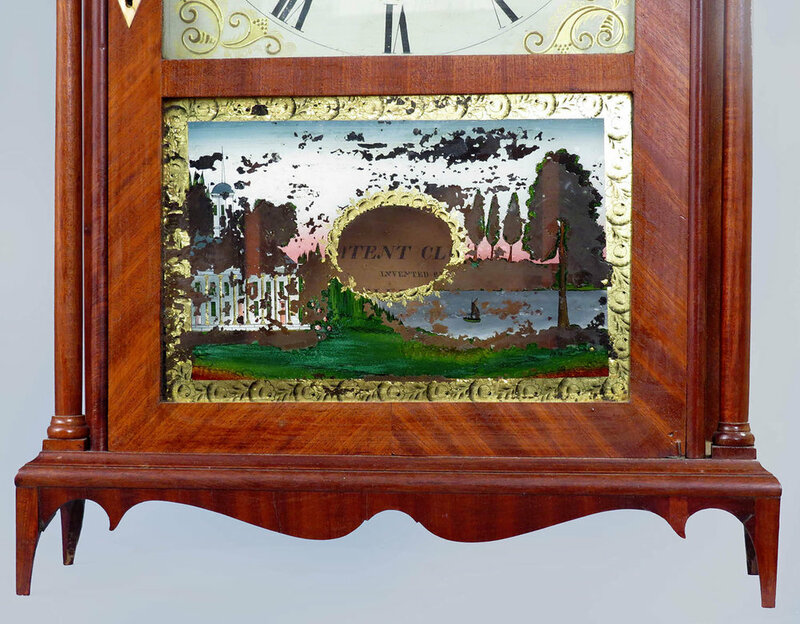 The painted wood dial is the original with raised gilt and colorful spandrels. There is minor paint loss across the center and some darker discoloration in areas. The label is dark and rather fragile looking but it is quite legible and has the states and Connecticut census of 1820. An important plus is that it retains the original cast brass finials. In addition, it has a very nice pair of original eagle hands plus the original pendulum, key and weights. 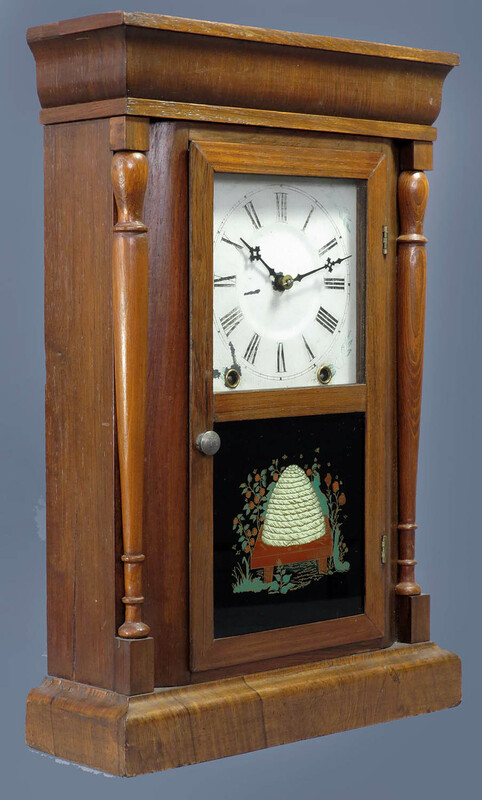 The thirty-hour wood movement is the original one for this case. I looked the movement over as best I could and noted that it needs four teeth repaired on the time side great wheel. The rest of the movement looked fine and new weight cords have been put on recently. 9003 E. Terry & Sons, Plymouth, CT pillar and scroll clock. 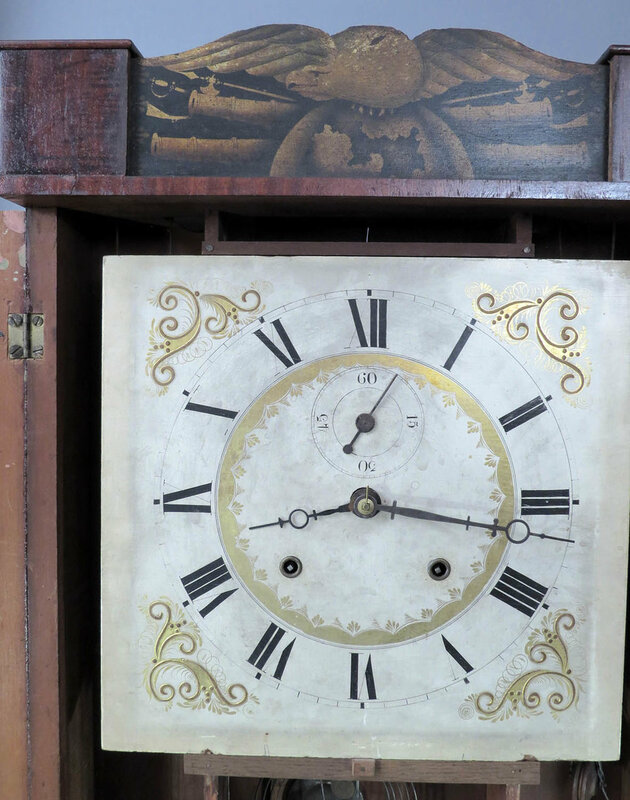 This clock needs restoration but it is priced accordingly. The scroll top is original but the right scroll tip was repaired and the left was replaced. It is lacking finials. The base is an old replacement and part of the skirt is missing. It is also missing a piece of quarter round on the bottom left. The wood dial is original but but someone probably tried to improperly clean it because the numerals and spandrels have been weakened. On a positive note, both glasses are original. The reverse painted tablet does have quite a bit of paint loss but there is plenty left to warrant a good restoration by Moberg. There is a very good label and original weights. The hands and pendulum are replacements. 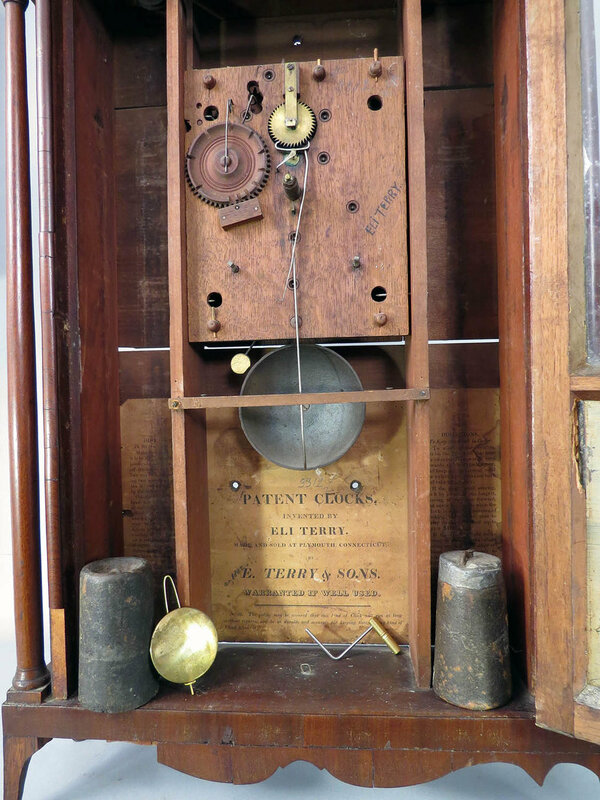 This is a 30-hour clock with hourly strike on a bell. The wood works movement is original to the case. It has one repaired tooth on the time great wheel, 2 chipped ratchet teeth on the strike drum and it needs new cords. 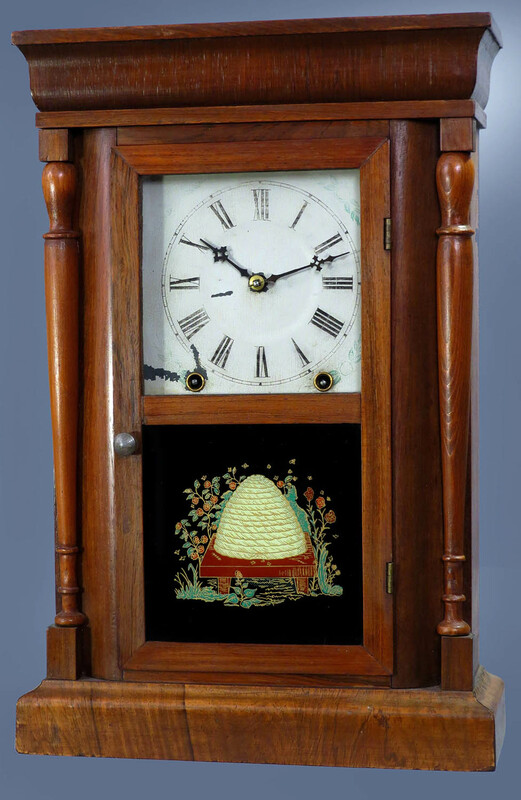 9004 Ephraim Downes for George Mitchell, Bristol, CT carved transition shelf clock. 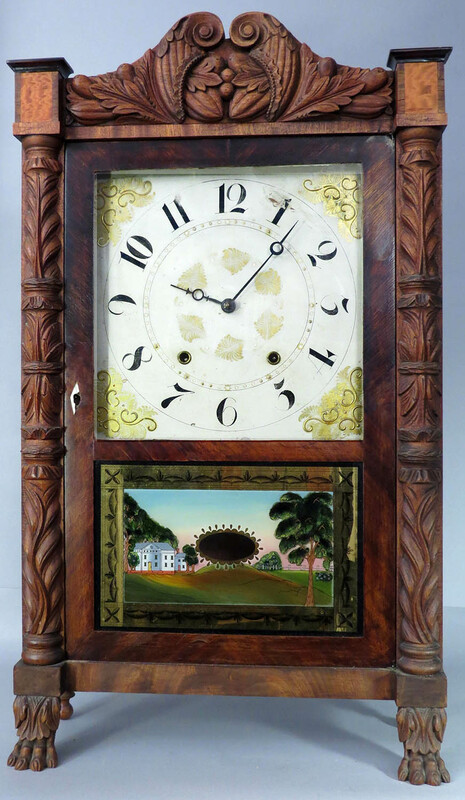 This is quite a handsome clock with a nicely carved case. There are carved columns, paw feet and a double cornucopia crest which is flanked by capitals which are cross banded and have tiger maple panels. Note that someone started to refinish the clock but did not complete the job. A piece of the ivory escutcheon is missing. 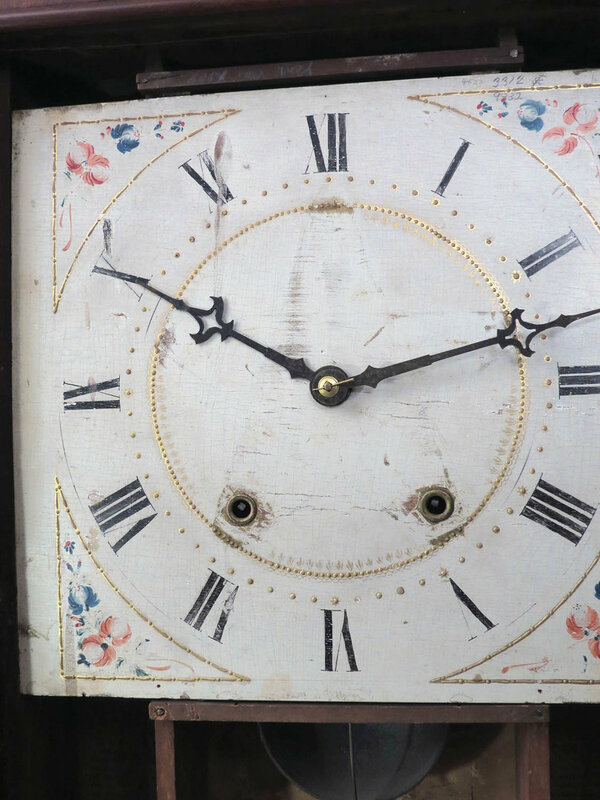 The painted wood dial in good condition but for two small worn spots at the 11 and the 2 positions. The upper glass is original. The lower glass has been replaced with a professionally done reverse painting with gold leaf border and center. The painting is perfect. The label is quite dark but it is still legible. It comes with the original hands, pendulum and weights. This clock has a 30-hour short drop wood works movement. I did not try running the clock but the movement appears to be very clean, it has new cords and appears to have been recently rebushed. eight-day wood works shelf clock. The stenciling on this clock is much better than average. The columns show very little wear. This is an early style case where the blocks above the columns are stenciled and the entire front of the case is the door. The spread-eagle splat is great, depicting an eagle on the globe with cannons, muskets, swords etc. The mahogany case has an old finish and the veneer shows almost no loss at all. Both glasses are original but the lower has an old reverse painting of only average quality with some flaking in the sky area. The painted wooden dial is extra nice with gold spandrels and the rare bonus of a seconds dial. The dial would benefit from a bit of careful cleaning but it is otherwise fine. It has an extra nice large label which boldly proclaims that this is indeed, an eight-day clock. Expensive in its day. It comes with the original pendulum, key, compounded pulleys and moon hands. It did not come with weights. I found an old pair which fit properly but are 8 ½ pounds each. I do not know if that is sufficient to run this clock. I have not checked the running condition of the movement. I would prefer not to ship this large and somewhat fragile clock. Eight-day wood works clocks are not at all common and it is unusual that I would happen to have two at the same time. 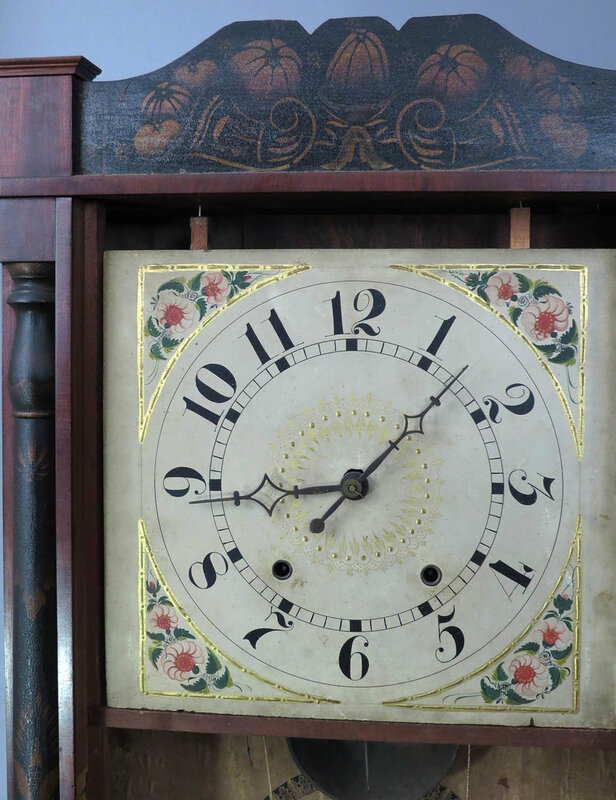 This clock has a great looking mahogany case which was nicely refinished a number of years ago. The veneer is just about perfect and it retains the original satinwood escutcheon. The stenciling is bold and shows very little wear. The double cornucopia splat has been trimmed down by perhaps ¼ inch. Both glasses are the originals but the lower has lost all the reverse painting except for the bottom portion. The label is quite good and it notes that these are “ IMPROVED EIGHT DAY CLOCKS” in bold print. 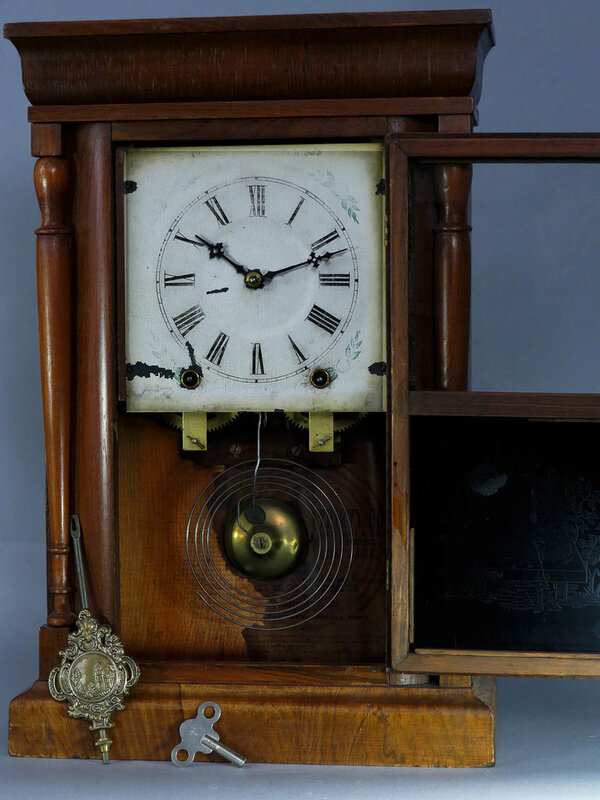 This clock comes with the original extra large weights, compounded pulleys, hands, pendulum and key. Note that this style movement has mahogany plates with ivory bushings. Perhaps that is the “improved” aspect mentioned on the label. With a quick inspection I noted some chipped ratchet teeth on the time winding drum and one missing pinion leaf on the strike second arbor. I would prefer not to ship this large clock and heavy weights. 9007 Early four column shelf clock by Seth Thomas. I use the term “early” because the label notes that this clock was made in Plymouth Hollow before the name change to Thomaston in 1865. It has a refinished mahogany case with only a few pretty minor veneer chips and four freestanding columns. The upper two glasses are original with one being a reverse stencil floral design. The very bottom glass is a replacement. The zinc dial has a raised chapter ring and colorful floral corners. You can see that there is some paint loss at the bottom. The label is a little dark but it is all quite legible and complete. This clock comes with the original hands and pendulum. The weights are replacements but they do fit and are of the correct weight to run the clock. Note that this clock takes those thin wafer style weights. This is a 30-hour clock with hourly strike. It is running but is long overdue for a cleaning. 26 ½ inches tall. $145. 9008 Rare and early Seth Thomas shelf clock. 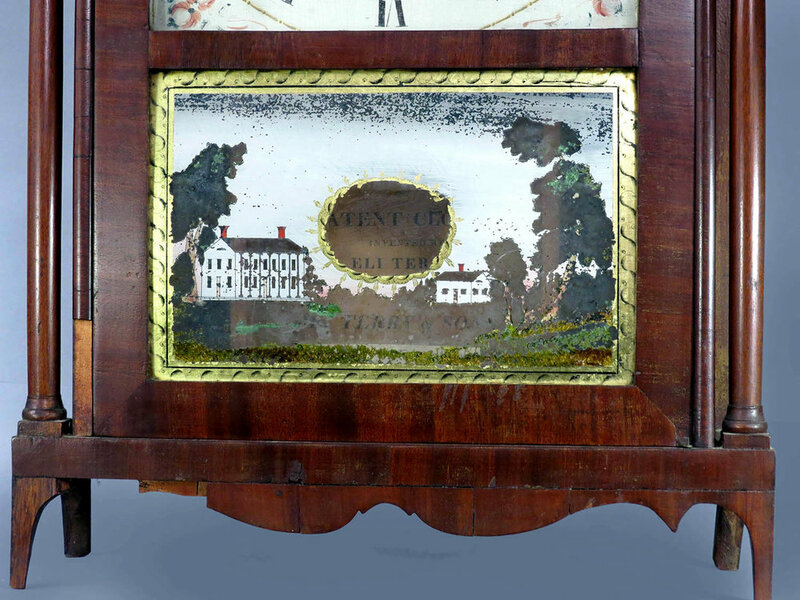 This clock has that early style label featuring horses and a stagecoach and noting that it was made in Plymouth Hollow, Connecticut not Thomaston as were all the later clocks. The case has been beautifully refinished, the veneer is perfect and it is ready for your shelf. There are four freestanding black columns. That little knob that you see at the top was used to secure the clock in the original shipping crate. That is why you see a small hole in the top of many Seth Thomas clocks of that era. Most of those knobs were taken off and thrown away. 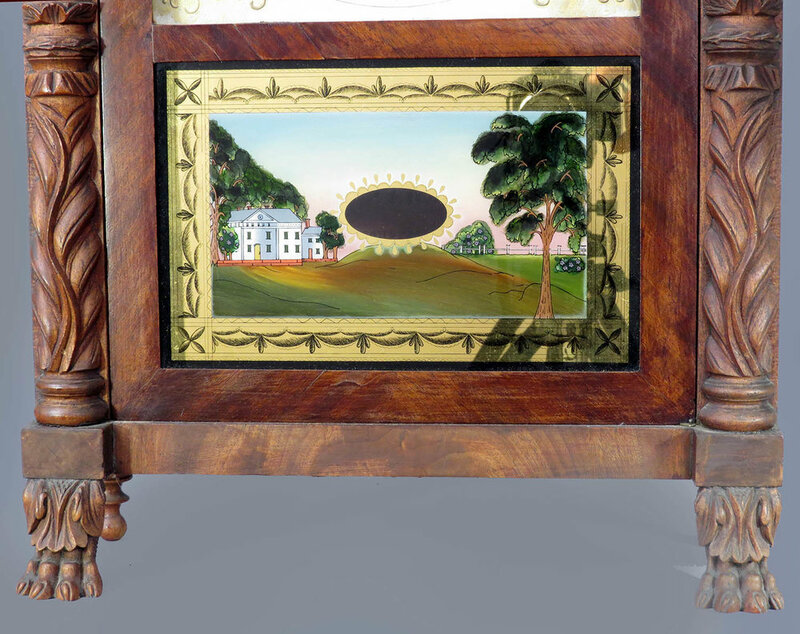 Both glasses are original and the lower has the original reverse painted scene of houses and grounds. That painting has only a couple very small flakes. The dial is zinc with a raised chapter ring. Years ago it was touched up and the numerals were redone. The label is in excellent condition. It has been covered with a piece of mylar to protect it and that may show up as a reflection in the photographs. The pendulum and key are original while the hands are proper style replacements. 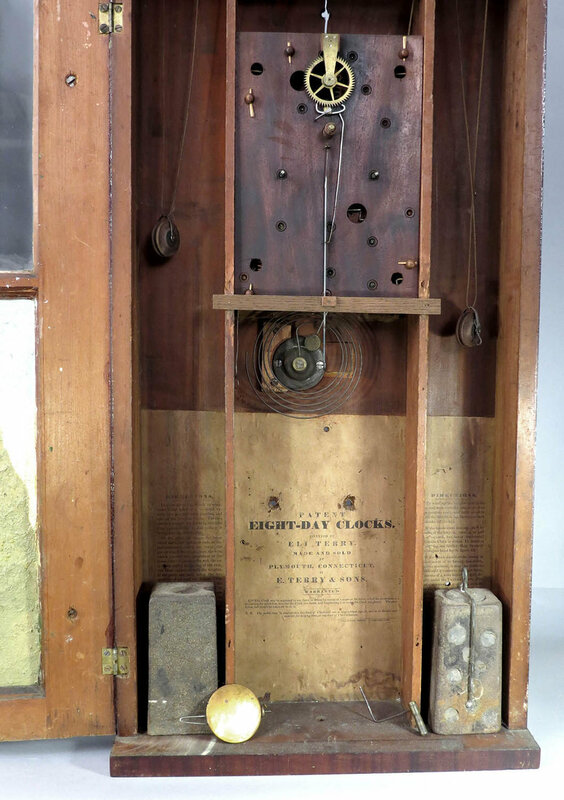 This is a 30-hour spring driven clock with hourly strike. It has that early lyre movement which is signed “S. Thomas Plymouth, Conn, USA.” That movement is very clean and is in good running order. This clock needs nothing other than finding a perfect spot to display it. 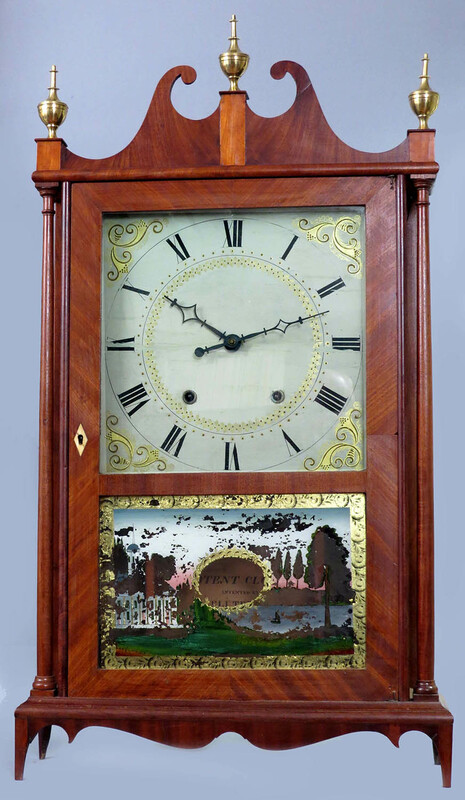 9009 Ansonia Clock Company column shelf clock. 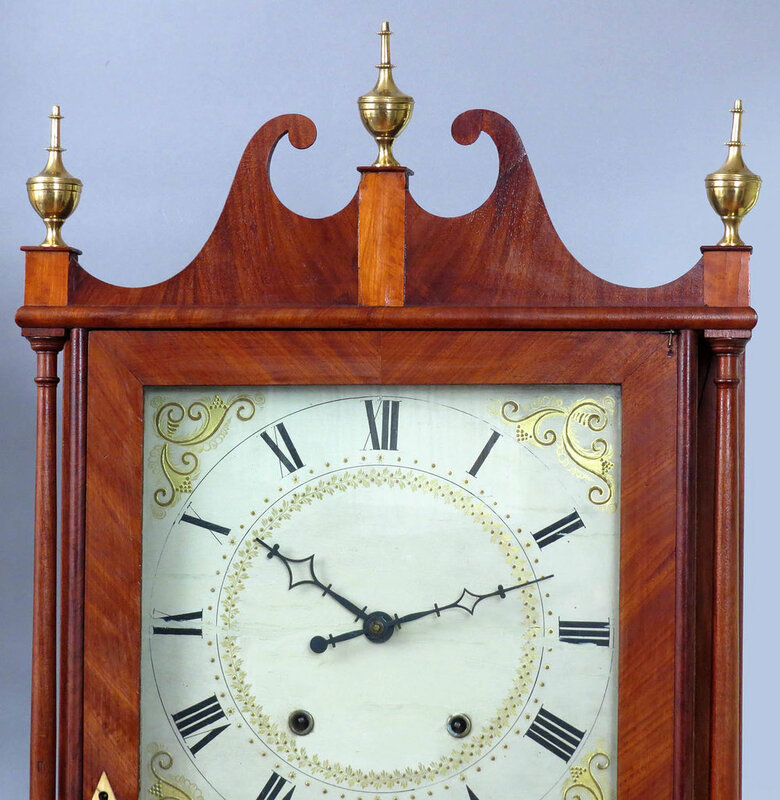 This clock has a mahogany case with an ogee style molding at the top. It has been refinished and is in good condition but for some fairly minor veneer chips. There are half columns flanking the sides but note that the last fellow put them on upside down. You might want to correct that or leave it as a bit of the clock’s history. The upper glass is original while the reverse painted tablet is a replacement. The painted zinc dial shows some numeral fading from years of cleaning. The hands are original while the pendulum is a replacement. The left half of the label is missing. The movement is eight-day brass, spring driven and it appears to have been recently serviced and rebushed. It is running.